Read one of my recent pieces for The Economist in full below or the original by clicking on this link. THERE is something of the 19th century about the science of dysmorphology. The idea that medical conditions, such as Down’s or Angelman’s syndromes, whose main consequences are neurological and behavioural, imprint themselves on the body’s shape in ways reliable enough to be used for diagnosis sounds disturbingly like phrenology or physiognomy. Be that as it may, they do—and for these and many other developmental disorders, dysmorphology works. 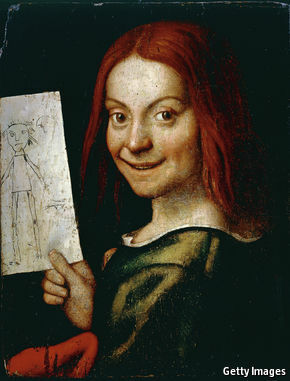 Indeed, on this basis, the 16th-century painting above is thought to be of a child with Angelman’s. Dr Nellaker and Dr Zisserman are therefore developing software that learns to spot syndromes (collections of co-occurring symptoms) by looking at pictures of people who have been diagnosed with them. The program pays attention to the features in each face that are important for a diagnosis, such as the shape and position of the eyes, eyebrows, lips and nose. It then clusters faces with common characteristics, as exhibiting the same syndrome. Crucially, the pictures it uses do not have to be staged (as, for example, a machine-readable passport photograph is) to have consistent lighting, background, angle of presentation of the face, and so on. The program is able to learn to ignore such things in ways human beings find hard. So far, the researchers have tested the system on 1,400 pictures of people with eight of the most common disorders. These include Down’s and also progeria, which causes children to age rapidly. It was, as they had hoped, able to divide the photographs spontaneously into eight clusters. Moreover, these clusters agreed 93% of the time with doctors’ diagnoses of the people whose photographs were in them. That is good. It could certainly be improved upon, though, and Dr Nellaker and Dr Zisserman are not suggesting that their system has advanced enough to take over the diagnosis of these eight reasonably well-understood conditions. But 93% accuracy may well be an improvement on current diagnosis of rarer developmental disorders. At the very least, it would narrow the range of likely diagnoses. Tests of 1,300 pictures of people with another 83 disorders—syndromes for which far fewer images are available for the initial training—have shown it works with these, too. That would make it worth searching for other pictures of such conditions, to improve accuracy. To this end, Dr Nellaker and Dr Zisserman are forming collaborations with teams in other countries. They also plan to launch a website to which anyone who has been diagnosed with a relevant disorder can upload a photograph of himself, for the software to learn from. If it all works, then the old science of dysmorphology really will have been given a new lease of life.